This article describes the journey of the Pandavas from Hastinapura to Khandavaprastha where they are to build a city and rule half of the territories controlled by the Kuru kingdom alloted to them by Kuru king Dhritarashtra . This article is part of a series of articles related to narrations of journeys mentioned in Mahabharata. These travel narratives are extremely important for researchers who study about the ancient geography that existed during the period of Mahabharata. Soon after the Pandavas arrived at Hastinapura from Kampilya after their marriage with Panchala princess Panchali, the Pandavas were asked to go to Khandavaprastha, that lied in the fringes of the Kuru kingdom. They were given this land as their share of half the kingdom. It was an undeveloped land and stood in the midst of an unreclaimed desert. Mbh.1.208:- King Dhritarashtra addressing Yudhishthira, said, Listen, O son of Kunti, with thy brothers, to what I say. Repair ye to Khandavaprastha so that no difference may arise again between you and your cousins. If you take up your quarters there no one will be able to do you any injury. Protected by Partha Arjuna, like the celestials by the thunderbolt, reside ye at Khandavaprastha, taking half of the kingdom' Vaisampayana continued, Agreeing to what Dhritarashtra said, those bulls among men worshipping the king set out from Hastinapura. And content with half the kingdom, they removed to Khandavaprastha, which was in unreclaimed desert. The name of the place, viz. Khandavaprastha came from a forest land named Khandava that lied inside the territory of the Nagas . In this territory lived a Naga king named Takshaka, his son Aswasena, wife, numerous Nagas and Rakshasas. 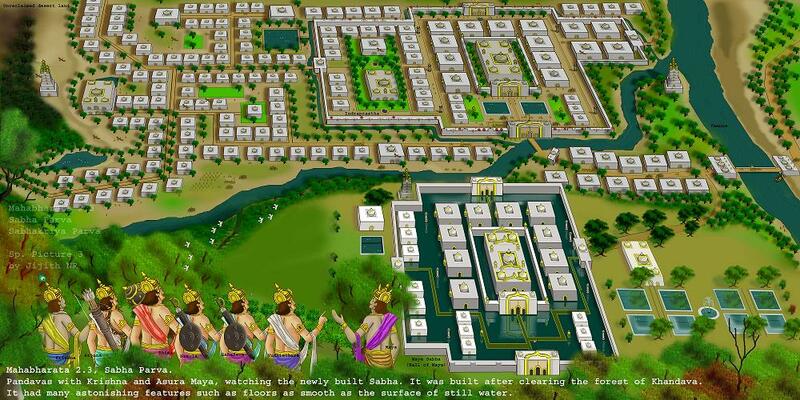 The Asura architect Maya was then working for Takshaka to build a beautiful mansion for the Naga king. The Asuras and Nagas were natural allies and often lived together, like in the Asura cities like Hiranyapura and in the Naga cities like Bhogavati. The Asura appellation was also given to Naga chiefs. Both the terms, Asura and Naga, were generic in nature and were applied to a large number of tribes often in overlapping manner. The Nagas and Asuras were spread across the world in various continents far and wide and were also good at sea-navigation. The Maya_civilization in meso-America seems to be an extension of this Asura-Naga culture, especially the Mayan branch of this culture, spread from India. The Mayan civilization could be thus established by the descendants of the Asura architect Maya. The Mayan architecture and the structure of the temples and other buildings constructed by them also attest this fact. Another, Naga chief named Kaliya had his territories towards the south-west on the banks of Yamuna close to Mathura. 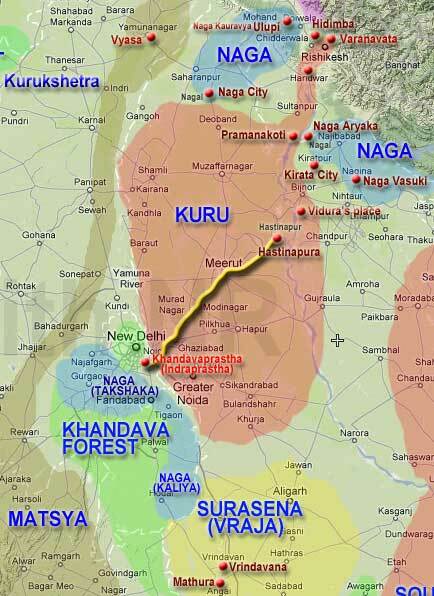 Vrishni Yadavas under the leadership of Krishna had formerly caused Kalia Naga to relocate his territories elsewhere. Thus the land inherited by the Pandavas was a Naga dominated region. Mbh.1.208:- The Pandavas, with Krishna at their head, arriving at Khandavaprastha, beautified the place and made it a second heaven. And those mighty car-warriors, selecting with Dwaipayana's assistance a sacred and auspicious region, performed certain propitiatory ceremonies and measured out a piece of land for their city. Then surrounded by a trench wide as the sea and by walls reaching high up to the heavens and white as the fleecy clouds or the rays of the moon, that foremost of cities looked resplendent like Bhogavati the capital of the nether kingdom decked with the Nagas. 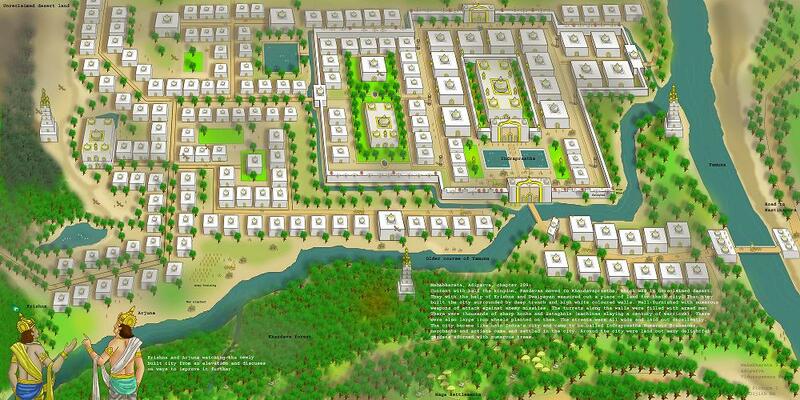 The newly built city at Khandavaprastha was then named Indraprastha. It means the city of Indra, the king of the Devas. The word Indra also means, the very best. Hence Indra-prastha can also mean the best-city. The comparison of Indraprastha to Naga capital city Bhogavati (located somewhere in Tibet) is really intriguing. It indicates that the Nagas were foremost city builders before the Kurus and, the Kurus competed to build cities that resembled or excelled the Naga cities. Kuru cities usually emerged on the site of existing Naga cities, often causing the relocation or the destruction of the Naga settlements. The Kuru city Hastinapura and the Panchala city Ahichatra too were built over the former settlements of the Nagas. Hastinapura was formerly known by the name Nagapura. Ahichatra means the land of Ahis, the Nagas. At least some portions of the city was constructed after burning and clearing a portion of the Khandava forest which resulted in the relocation and destruction of many Nagas. The passages from Mbh.1.223 to Mbh.1.235 describe how Arjuna and Krishna caused a great fire in the territory of Naga Takshaka. At that time Takshaka was not in his territory but was in Kurukshetra. 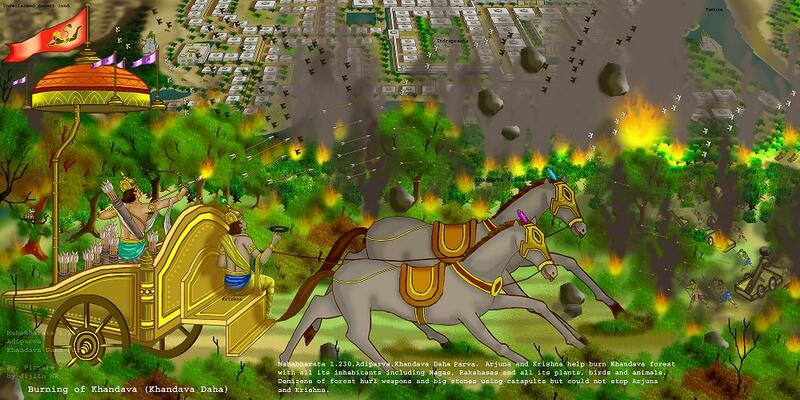 The whole of Khandava forest was burned. The fire raced for fifteen days. Takshaka's wife was killed but his son Aswasena escaped. Arjuna was offered stiff resistance but the Nagas were defeated. Most of them were killed and others had to leave the territory. The Nagas were assisted by some warrior probably belonging to Deva or Gandharva tribe, which Mahabharata portray as Indra (who ruled in Tibet). The Asura architect who was then working for Taksaka to build a mansion for him was spared his life. To pay gratitude for sparing his life, Maya built an assembly hall for Yudhisthira where he was planning to build a mansion for Takshaka. This assembly hall became very famous due to is wonderful architecture and workmanship. It had smooth floors that gave the illusion that the floor was the surface of water in a tank. It had water tank with water so still and pure that people mistook that to be floor with no water at all. Construction of this assembly hall is narrated at Mbh.2.1 and Mbh.2.3. It took fourteen months for completion. The entry of Yudhisthira into the assembly hall as the king of Indraprastha is mentioned at Mbh.2.4. Mbh.1.208:- Indraprastha stood adorned with palatial mansions and numerous gates, each furnished with a couple of panels resembling the out-stretched wings of Garuda. And it was protected with gateways looking like the clouds and high as the Mandara mountains. And well-furnished with numerous weapons of attack the missiles of the foes could not make slightest impression on them. And they were almost covered with darts and other missiles like double-tongued snakes. The turrets along the walls were filled with armed men in course of training; and the walls were lined with numerous warriors along their whole length. And there were thousands of sharp hooks and Sataghnis machines slaying a century of warriors and numerous other machines on the battlements. There were also large iron wheels planted on them. And with all these was that foremost of cities adorned. The streets were all wide and laid out excellently; and there was no fear in them of accident. And decked with innumerable mansions, the city became like unto Amaravati and came to be called Indraprastha like unto Indra's city. 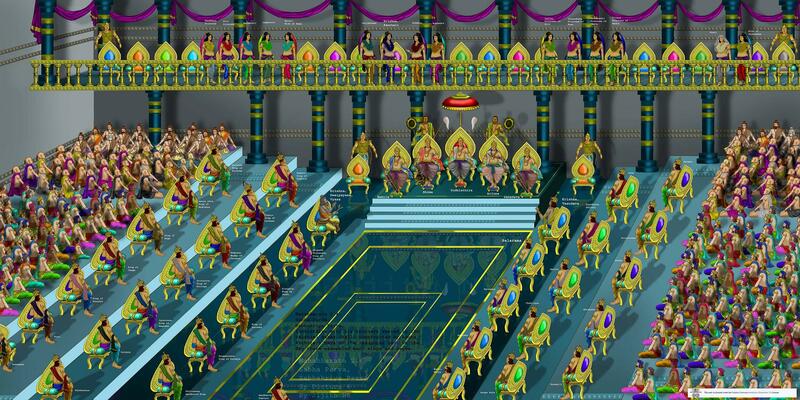 In a delightful and auspicious part of the city rose the palace of the Pandavas filled with every kind of wealth and like unto the mansion of the celestial treasurer Kuvera himself. And it looked like a mass of clouds charged with lightning. When the city was built, there came, numerous Brahmanas well-acquainted with all the Vedas and conversant with every language, wishing to dwell there. And there came also unto that town numerous merchants from every direction, in the hope of earning wealth. There also came numerous persons well-skilled in all the arts, wishing to take up their abode there. And around the city were laid out many delightful gardens adorned with numerous trees bearing both fruits and flowers. There were Amras mango trees and Amaratakas, and Kadamvas and Asokas, and Champakas; and Punnagas and Nagas and Lakuchas and Panasas; and Salas and Talas palm trees and Tamalas and Vakulas, and Ketakas with their fragrant loads; beautiful and blossoming and grand Amalakas with branches bent down with the weight of fruits and Lodhras and blossoming Ankolas; and Jamvus blackberry trees and Patalas and Kunjakas and Atimuktas; and Karaviras and Parijatas and numerous other kinds of trees always adorned with flowers and fruits and alive with feathery creatures of various species. And those verdant groves always resounded with the notes of maddened peacocks and Kokilas blackbirds. And there were various pleasure-houses, bright as mirrors, and numerous bowers of creepers, and charming and artificial hillocks, and many lakes full to the brim of crystal water, and delightful tanks fragrant with lotuses and lilies and adorned with swans and ducks and chakravakas brahminy ducks. And there were many delicious pools overgrown with fine aquatic plants. And there were also diverse ponds of great beauty and large dimension.